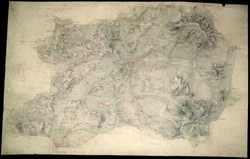 This plan of the Vale of Gloucester is indicative of the draughtman's convention of "relative command": the indication of relative heights of hills by numbers; hill 3 being higher than hill 2, for example. Brushwork interlining ('hachuring') and ink washes further depict relief. Pencil rays intersect across the map, evidence of measurements taken by the surveyor between fixed triangulation points. Archaeological details, such as those at Bredon Hill (at the top right of the plan), are documented even though this did not become obligatory until 1816. The rivers Severn and Leadon and part of the Hereford and Gloucester Canal are described at the bottom left of the map, with Tewkesbury situated centrally at the confluence of the Severn and Upper Avon Rivers.